After completing her piano studies in Moscow, the German-Russian soprano Irina Papenbrock began her vocal training at the Music Academy „Hanns Eisler“ in Berlin in the class of Julia Varady. Masterclasses with Uta Priew, Waltraud Meier, Dietrich Fischer-Dieskau and Thomas Quasthoff, as well as acting lessons with Knut Sommer (assistant to Götz Friedrich and first director of the Deutsche Oper Berlin) complemented her education. Already during her studies Irina Papenbrock played the role of Fenena in Verdi’s NABUCCO at the Oper Schloss Rheinsberg, after the Richard Wagner Association had chosen her for the Bayreuth Festival. In recognition of her excellent academic achievements, she received a scholarship from the Friends of the Academy „Hanns Eisler“ for her studies, and she participated in a concert by the Federal President at Schloss Bellevue. Irina Papenbrock sang the roles of Carmen in Bizet’s CARMEN, Donna Elvira in Mozart’s DON GIOVANNI, Ottavia in Monteverdi’s CROWN OF THE POPPEA, Charlotte in Massenet’s WERTHER. Her great debut was in the title role of Rossini’s CENERENTOLA with the Munich Chamber Opera at the Cuvillies Theater. This was followed by numerous guest appearances in Leipzig, Vienna, Stuttgart and Zurich; and the role of Rosina in Rossini’s IL BARBIERE DI SEVIGLIA, which she performed with great success with the Kazan State Theater in Holland and Belgium. Lieder recitals and concerts led Irina to the Berliner Philharmonie, the Berliner Konzerthaus, the Cuvilliers Theater Munich, the Savonlinna Festival Hall in Finland, the Aichi Arts Theater Nagoya in Japan, the Oritiz Tirado Opera Festival in Mexico, the Teatro Massimo in Palermo, the Witold Lutoslawski Concert Hall and the Filharmonia Narodowa in Warszawa. Irina Papenbrock works with renowned conductors such as Jonas Alber, Nabil Sheata, Daniel Barenboim, Tadeusz Kozlowski and Michail Jurowski and is highly esteemed for her musical personality. This was followed by lyric parts such as Semfira in Rachmaninov’s ALEKO and Iolanta in Tchajkowski’s IOLANTA at the Berlin Philharmonic. Her voice unfolds with a voluminous lyrical-dramatic sound with a stable depth and middle position and a radiantly illuminating height and thrills critics such as Joachim Kaiser. 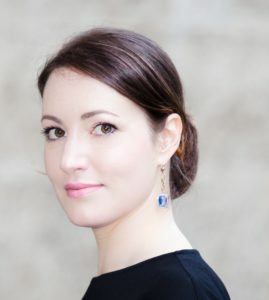 She works on her dramatic soprano repertoire (including Tosca, Turandot, Puccini’s Manon Lescaut, Elisabeth, Abigaille, Lady Macbeth and Amelia von Verdi) at the Teatro alla Scala with Michail Jurowski and Massimiliano Bullo (vocal coach of the Teatro alla Scala); as well as Wagner roles such as Isolde, Brunhilde, Elisabeth and Sieglinde. With her expressive concert version of Isolde from Wagner’s TRISTAN UND ISOLDE under Michail Jurowski, she conquered the Italian audience at the Teatro Politeama Garibaldi in Palermo, as well as in Warsaw, where she performed at a special invitation of the Wagner Society. Just released is the recording of last year’s complete premiere of „Moses“ by Anton Rubinstein under the baton of Mikhail Jurowsk.